Here's our full guide to both tracking and down and slaying the Urugaan in Monster Hunter World. The Urugaan looks a bit like the Radobaan of Monster Hunter World, but on steroids. In this Monster Hunter World Urugaan guide, we'll be walking you through all the information you should know about the monster before you go tracking it down and killing it. 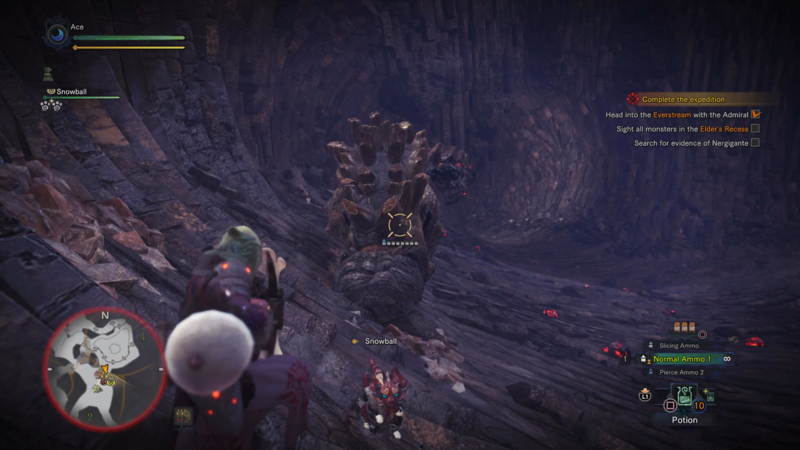 Should you instead need anything else on the massive game of Monster Hunter World, such as how to quickly track down a monster using the Scout Flies, as well as how to safely capture a monster in order to harvest rare monster items, then head over to our Monster Hunter World guides walkthrough hub. You’ll find the Uragaan after you’ve embarked on your quest to venture into the Elder’s Recess area of Monster Hunter World. Come prepared, because although the mission firstly seems like a simple exploration task with the Admiral, you’re quickly pitted against brand new monsters like the Uragaan, as well as many other powerful foes lurking in the depths of the world. 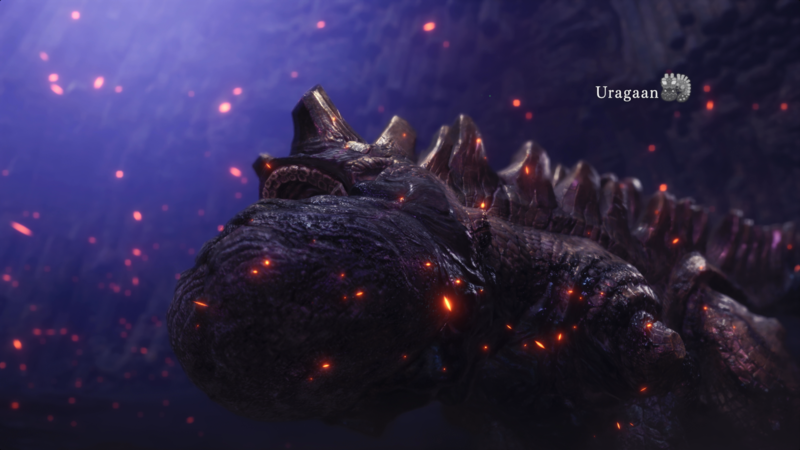 If you think the Uragaan looks similar to the Radobaan, then you’re not wrong. It has many of the same tendencies and abilities as the Radobaan, like rolling itself up into a ball to flatten you, or whipping its tail round to pelt you with rocks. Except the Uragaan is also able to pelt you with small, exploding balls, which will blow up after roughly three seconds lying on the ground. It’s therefore imperative that you bring armor that focuses on defense rating over all else, as the Uragaan is a physical foe. First off, you’ll want to try and keep your distance from the Uragaan when you’re fighting it. The Bow, Light Bowgun, or Heavy Bowgun are all great options for tackling the Uragaan, and you’re going to want to aim for the glowing red dots on the belly of the beast when firing off arrows, as this is the Uragaan’s main weak point. But if you do choose to go with melee weapons instead, we’d recommend a quick weapon like the Dual Blades or Insect Glaive, over slower, albeit more powerful weapons like the Switch Axe or Great Sword. The Uragaan does tend to follow the attack patterns of the Radobaan, so be prepared for swiping tail attacks that will pelt you with exploding balls instead of simple rocks. Keep in mind that the balls do take a few seconds to explode once they hit the ground, so you’ve got a good window to dodge out of the way. The Uragaan also likes to get close to the player, and then pound the ground with its face. It’s not too difficult to avoid this attack, as the Uragaan won’t pivot on the spot when it’s executing the slam attack, meaning you’ve got ample time to dodge out of the way. The High Rank Uragaan armor set is once of the most powerful armor sets in MHW, boasting a brilliant defense rating of 311, while also giving you great protection against Fire and Thunder attacks. 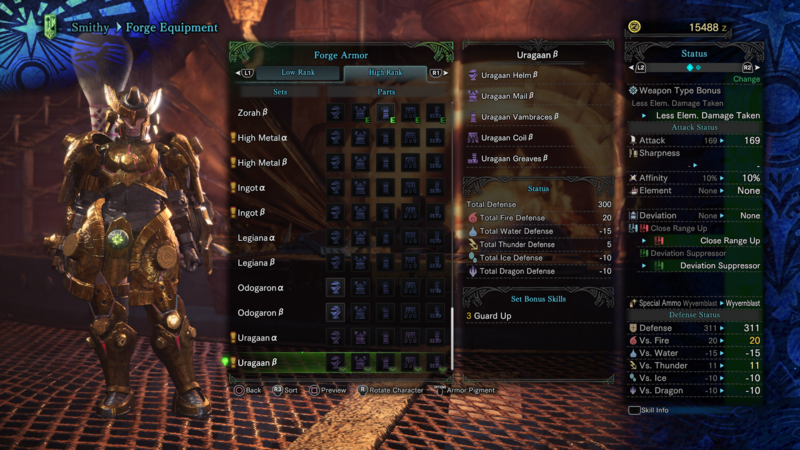 It’s definitely an armor set you’ll want to set your sights on, even if you do have to farm the Uragaan multiple times for parts. We might be done with this guide on how to defeat the powerful Uragaan, but we have a wealth of additional Monster Hunter World guides, including our complete armor guide, as well as our full weaponry guide page.